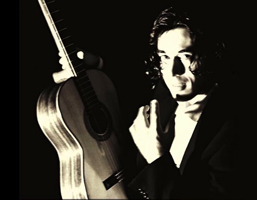 Guitarist/composer Celso Cano has captivated audiences in concert halls throughout the North and South America and Europe. The Aamulehti in Finland described him as “an artist with temperament, the model of good sound.” He has received numerous prizes and awards including Segovia International Guitar Competition and the D’Addario Foundation Fellowship. As a composer, his recent projects include a soundtrack composed for the feature film Minotauro (Flor Linda Films). His piece for cello, guitar and percussion, Eclipse, was composed and premiered in residence at the Baryshnikov Arts Center in New York City as part of a multidisciplinary collaboration of photography, music, film and dance. After moving from Perú to the U.S. with his family, he began his musical studies with Lou Mowad. He later received a full scholarship to study guitar performance with Tom Patterson at the University of Arizona where he earned his Bachelor’s degree. He studied guitar with Iliana Matos in Barcelona, and was fortunate to be mentored by Leo Brouwer in his composition studies while living in Spain. Recently, he earned his Master’s of Music degree in Guitar Performance from Florida International University where he studied with Rafael Padrón and Mesut Özgen. He has also performed in masterclasses by: Leo Brouwer, David Russell, Oscar Ghilia, Sharon Isbin, David Leisner, Scott Tennant, and Christopher Parkening. In addition to performing solo concerts, Mr. Cano has collaborated with many ensembles. He has been a guest artist with the Florida Grand Opera in productions of Il Barbieri di Seviglia and Don Pasquale and a soloist with the Tucson Symphony Orchestra. He also recently became the first guitarist to win the 18th Annual Concerto Competition of Florida International University’s Symphony Orchestra and performed Rodrigo’s Concierto de Aranjuez under the direction of James Judd. He is currently faculty of the College of Arts, Humanities and Social Science at Nova Southeastern University and is working on a new CD featuring his own music, the music of Tárrega, Barrios and Albeniz and his own transcriptions of Scarlatti, Geminiani and Mendelssohn.